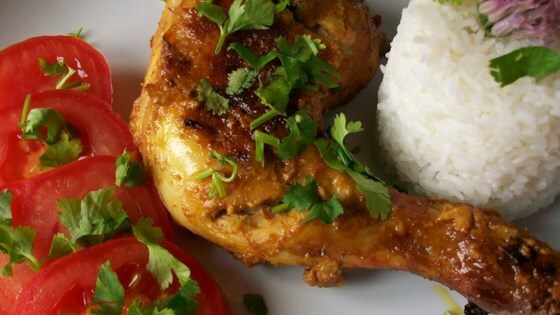 "This is an authentic recipe for Tandoori chicken. Serve with long grain Basmati rice, cucumber salad, grilled veggies, roasted corn on the cob and finish off the meal with Kulfi (Indian ice cream)." This dish can also be baked in a hot oven (450 degrees F) for 25 to 30 minutes, or until chicken is done. This was the best, most flavorful chicken tandoori I have ever made. I used skinless breasts on the bone, marinated them for 24 hours, and broiled them for 10-12 minutes on each side.